Microsoft is changing the way you back up your data by integrating its cloud-based storage and sharing service SkyDrive. In the event of a system crash, Microsoft has new features for quick and easy restoration of your computer, with minimal data loss. 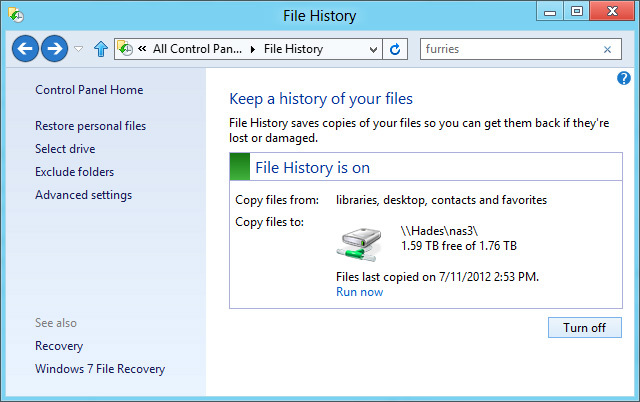 In addition to the new features PC ResetÂ andÂ PC Refresh, File History is a great new feature in Windows 8 and will be released in Windows 8.1. The File History feature should connect to the drive with the most amount of free space, or you can select the specific drive you’d like to use. To do this, click the â€œSelect Driveâ€ link in the column to the left and choose the drive you’d like to use. Navigate to the location of the file that you’re searching for in Windows File Explorer. Locate the â€œRibbonâ€ and click on the History Icon. Highlight the file you need to recover, and click the green â€œRestoreâ€ button.